Help Philip Werner of Section Hiker raise $5,000 for a Heifer Gift Ark. In May, Philip will be hiking in Scotland in the Great Outdoor Challenge – 200 miles in 15 days. Many hikers use challenges like this to raise money for charity. Philip has been an advocate of Heifer International for many years. You can read more about his challenge and the Heifer Gift Ark on his blog. So What is a Heifer Gift Ark? 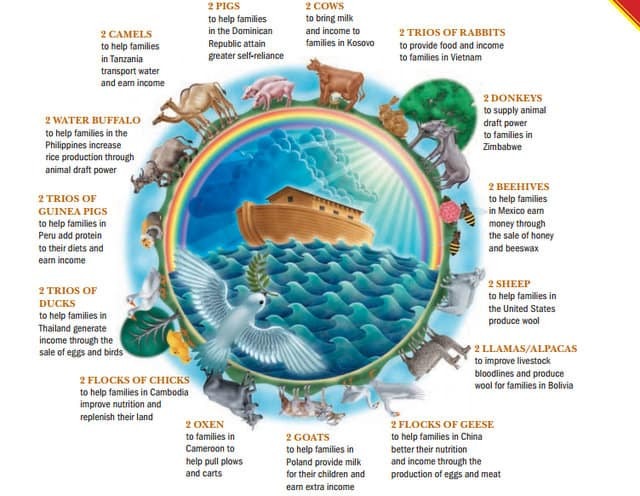 This infographic should explain what the ark will provide to people in third world countries. Click to expand. Adayak is helping Philip reach his goal by donating proceeds from the sale of Section Hiker t-shirts & apparel to his fundraising efforts. Philip is currently at $1,070 and with your help he will reach his $5,000 goal. If you’ve always wanted to buy a Section Hiker t-shirt but couldn’t quite pull the trigger, now is the time to make that purchase and help support a great cause. ← What Are Your 35?